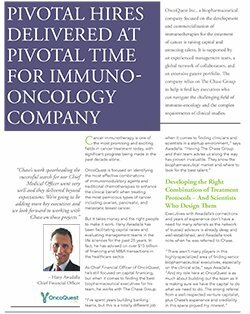 OncoQuest Inc., a biopharmaceutical company focused on the development and commercialization of immunotherapies for the treatment of cancer is raising capital and attracting talent. It is supported by an experienced management team, a global network of collaborators, and an extensive patent portfolio. 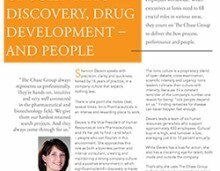 The company relies on The Chase Group to help it find key executives who can navigate the challenging field of immuno-oncology and the complex requirements of clinical studies. Cancer immunotherapy is one of the most promising and exciting fields in cancer treatment today, with significant progress being made in the past decade alone. OncoQuest is focused on identifying the most effective combinations of immunomodulatory agents and traditional chemotherapies to enhance the clinical benefit when treating the most pernicious types of cancer including ovarian, pancreatic, and metastatic breast cancer. But it takes money and the right people to make it work. Hany Awadalla has been facilitating capital raises and evaluating management teams in the life sciences for the past 25 years. In fact, he has advised on over $15 billion of financing and M&A transactions in the healthcare sector. As Chief Financial Officer of OncoQuest, he’s still focused on capital financing, but when it comes to finding the best biopharmaceutical executives for his team, he works with The Chase Group. Executives with Awadalla’s connections and years of experience don’t have a need for many referrals as the network of trusted advisors is already deep and well-established, and Awadalla took note when he was referred to Chase. 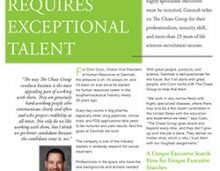 Awadalla engaged Chase to perform a search for a Chief Medical Officer at OncoQuest. While the start was a bit bumpy, the combined team got on track quickly. Awadalla says the Chase team did more than simply ask a standard set of questions and take notes. A biopharmaceutical startup such as OncoQuest – founded in 2015 – is not for every executive. Optimal candidates with the desired credentials are often more comfortable in larger companies with well-developed pipelines. OncoQuest Inc., was founded in 2015 and is focused on commercializing a portfolio of immuno-modulatory antibodies for the treatment of cancer. OncoQuest has been able to demonstrate clinically that its antibodies enhance tumor-specific immune response and its lead drug candidate, oregovomab, for the treatment of frontline ovarian cancer, has yielded positive data in 2018. The Chase Group has helped OncoQuest hire a Chief Medical Officer who is now building out a larger clinical team to manage a promising pipeline and several proof-of-concept clinical studies focused on ovarian, pancreatic and metastatic breast cancer. 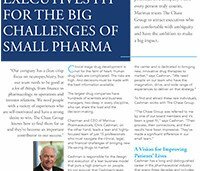 biologics and small molecule oncology drugs, the new executive is filling a crucial role. Awadalla says the needs at OncoQuest will continue to grow, and the work with Chase will continue.